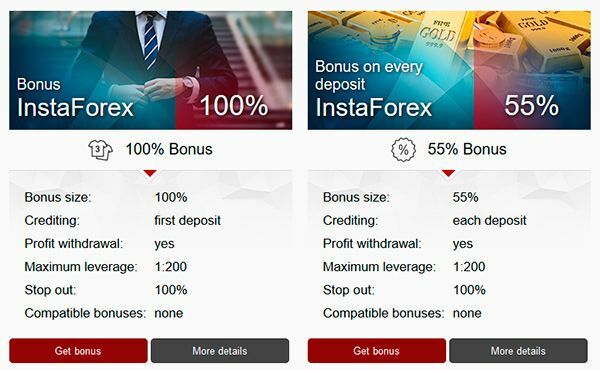 Instaforex Bonus & Review – Is it Reliable Forex Broker? Deposit bonuses from 30% to 100%. Forex is the worlds most heavily traded market, providing traders with many different currency pairs and a 24 hours a day, 5 days a week market. With that, it allows traders to trade throughout the day, identifying different pairs to trade. However, more importantly you need to find the right broker and platform to use. Instaforex is our subject of review and we’ll go into the details of the company, giving you the opportunity to see if this is the right fit for you. Instaforex is a Forex broker that offers traders a variety of services. One of the first items you will notice are the variety of bonuses the company offers. We’ll dive into that later but bonuses can give traders a unique way to increase returns. According to the website, there are 107 currency instruments, 88 CFD’s on United States stocks, as well as contracts on gold and silver. There is leverage available if you so choose as well as several different accounts. The quick overview shows a lot of potential, but let us dive deeper in Instaforex’s offerings. Reliability is a key component to any broker and platform and there a few ways to identify if the company is reliable. The ultimate is to open a demo account and begin testing items such as user interface and speed of execution; however, you can begin by looking at other material to get an idea of where the company’s mindset resides. By starting at the company’s about us page, Instaforex was created in 2007 and is, “…a top choice of more than 7,000,000 traders”. The page also states more than a thousand clients open account each day. It goes on to state that the company has been awarded prestigious prizes from CNBC Business Magazine and European CEO. There is an award page where you can view their many awards. You can go on to view a more detailed write up on their history, but from the looks of it, Instaforex appears to be cognizant of their brand and want to give their clients the best opportunity to succeed. The last item you can view are their licenses, which include CySEC. This is important as you need to ensure the broker works with you, rather than against you. One of the more opportunistic services offered by Instaforex are their bonuses and other incentives. You can view in full detail their bonuses via their website, but here is a quick overview of what you can select when signing up. Remember, bonuses typically have a restriction or requirements to be met before you are able to withdraw your bonuses. First, there is a 100% bonus that appears to be credited on your first deposit. Unlike other brokers and platforms, Instaforex appears to do a respectable job of laying out all the details of the bonuses, leaving potential clients with all the necessary information. From there, you can view a bonus on every deposit, which currently sits at 55% according to their website. Should you decide that 55% is too much, you can select a lesser option that is 30%. Same with the first bonus, there is a details page that spells out nearly everything you need to know before accepting the bonus offer. The last two include an Instaforex Club Bonus and Chancy Deposit. Bonuses are a great way to earn extra from your trading but you have to ensure it fits your needs. Many of the bonuses contain trading requirements before you withdraw your bonus funds. Always read the detail before accepting so you are not cut off guard when the time comes to withdraw your earnings. When selecting a broker, you want to ensure they work with the platform you use for trading. Luckily, Instaforex works with MetaTrader 4 and MetaTrader 5, as well as their own web version. 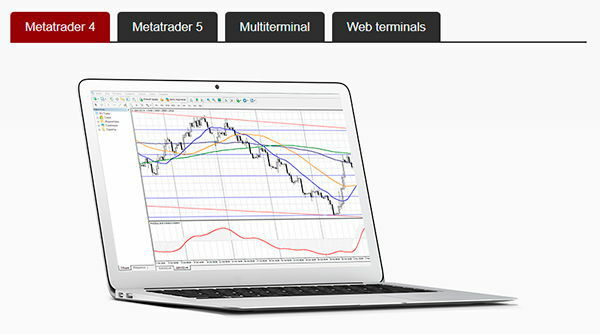 Some of the highlights of MetaTrader 4 include 9 time frames, variety of tools for technical analysis, automated trading, free indicators and advisors. 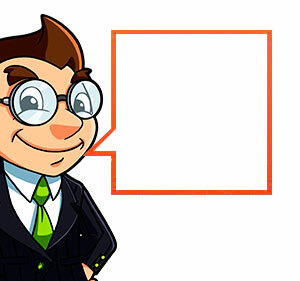 Having these on your trading platform can help accent your current trading style. From there, you can look to jump up to MetaTrader 5. This platform includes 21 time frames, level 2 pricing, automated quotes archive, and expiry dates for pending orders. MetaTrade 4 and 5 are the most popular trading platforms and have many of the tools traders need to succeed. It’s up to you to decide what fits your needs best. An added benefit to is Instaforex is multiterminal, which allows you to trade multiple Instaforex accounts at once. This is aimed to benefit those who manage client accounts, and the trading platforms run on the Microsoft Windows operating system. Lastly, Instaforex offers their users applications for both iOS and Android, giving you the ability to trade on the go. Having this ability is crucial because you need to trade when you need to trade. Not having the ability to access your account on the go can potentially cost you profits or worse, cost you money. One of the first items you should do as a new trader is investigate the demo platform. A demo platform not only allows you to gain a level of familiarity with the broker, but also allows you the ability test strategies without risking your hard earned capital. With Instaforex, you can open a fully functional demo account using the MetaTrader 4 platform. This will give you the chance to see if you enjoy the MetaTrader platform, and see if it will benefit you. 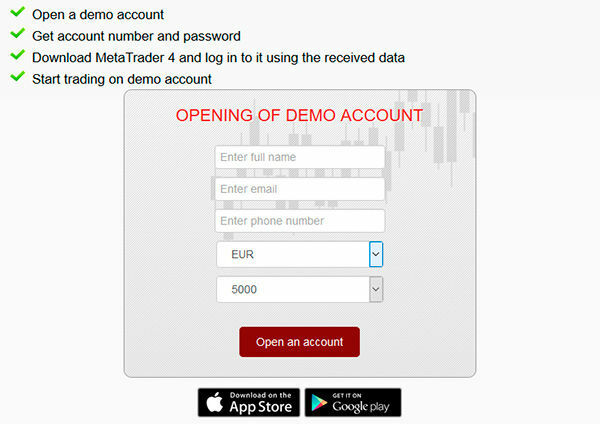 In order to open a demo account, you can head over to the demo account page and follow the instructions there. Again, opening a demo account is important because you can learn without risking your hard earned capital. 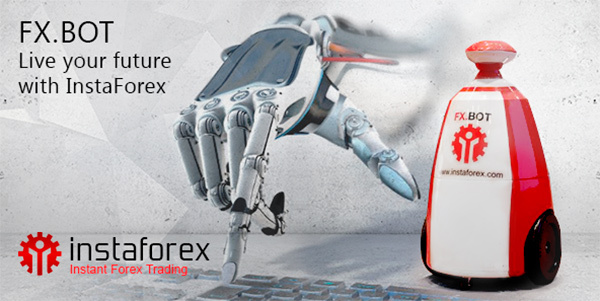 While this may not be entirely related to trading, Fx Bot is the first Forex droid (like a robots for binary option trading) in the world and is a symbol of the company’s effort to provide the latest and greatest to their clients. The droid has the ability to communicate, show images, and perform certain office rolls. Another perk to the Fx Bot is it has the ability to talk to with you about trading. This is an interesting marketing piece and advanced technological product that could be a glimpse into the future. Understanding how the flow of money works is important because as traders, you likely rely on your profits to live. Likewise, should you need to deposit more money, you don’t want the funds waiting to clear while opportunities pass you by. There are several ways to deposit including bank card, bank wire, and Skrill. For a complete list of the deposit methods, you can visit the deposit page of the website. For example, bank card deposits are processed within 24 hours, which is a very quick turn around. Bank wire can take longer with a reported 2-4 days to process. Beyond that, there are several methods that offer instant deposits and this may be optimal for most traders. Once you learned how to deposit your funds, it is equally important to understand how the withdraw process works. If you elected to participate in the bonus program, you’ll want to ensure you’ve met the requirements to withdraw your bonus money, otherwise you may be limited in what you can withdraw. You can withdraw your funds the same way you deposited your money, however, some of the methods you select may have a fee attached. With the bank card method there is a system fee and the withdraw process takes 1 to 6 business days. Should you select the bank wire method, there is a 2% fee and the processing time is 2 to 4 business days. While there are a variety of methods, you can certainly find one that fits with your trading schedule. Overall the Instaforex broker appears to have many of the services traders need in order to be successful. The first item is to open a demo account and get a feel for the platform and broker. This allows you to test what you need without risking your trading capital. From there, you can begin exploring the bonuses and other services the company offers their clients. Also, be sure to take advantage of the educational section of the website. This part of the website bring analysis of different Forex pairs and other markets, which can be used to spark your own research and expand your trading potential. Instaforex has the ability to be a top broker but that is up to you to decide. With their seemingly transparent website, it doesn’t appear they are trying to hide anything. You can always reach out to their customer support if you have any questions. However, the best way to view their services is to open a demo account and jump in.